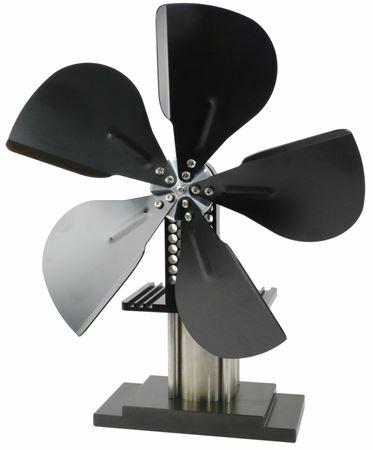 Stirling Engine Fans for Wood Stoves and Off-Grid. 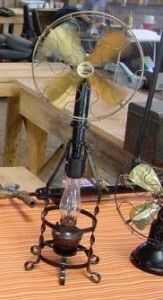 A handmade Stirling stove fan, sits atop his wood stove¹. Stirling engine fans for wood stoves are a practical way to move air around a wood stove, especially when you don’t have electricity. So What’s a Stirling Engine Fan? A Stirling engine fan integrates a Stirling engine and a fan to move air where you either don’t have, or don’t want to use, electricity. They are usually powered by a kerosene or alcohol flame or the heat from a hot wood stove. The article below explains how Stirling fans work, including an animation. There is a little bit about the history of Stirling engines used as fans. There’s also a video review I did of a Stirling engine wood stove fan vs a Peltier device wood stove fan. I’ve also included some design advice and tips on how to find plans or engines to copy, in case you want to build your own. How Do Stirling Fans Work? Either pay someone to fan you or get a Stirling engine fan. These fans are often called “hot air engine fans” and they are still popular among hobbyists and collectors. An antique Stirling engine (hot air engine) fan at an antique engine show. Antique Stirling engine fans for hot climates were the direct predecessors of today’s modern wood stove Stirling engine fans for cold climates. The fans of 100 years ago were generally powered by kerosene or alcohol flames and they moved the air gently around the room. Because they had much less power than a typical electric fan, as soon as electric fans became available, they went out of style. Reproduction antique Stirling engine fan. Since these fans were featured very prominently in the houses of the rich, many of them were developed into works of art. The reproduction antique shown above is still available and would look good in many offices and homes, even if you never ran it. Stirling engine fan for the top of a wood stove. A hundred years later, electricity and high powered electric fans were widely available, but there are still places where electricity is either not available at all or where people chose not to use it. A few manufacturers remembered the antique Stirling engine fans and started to build modern versions that were not powered by a kerosene flame, but indirectly powered by the heat of a wood stove. 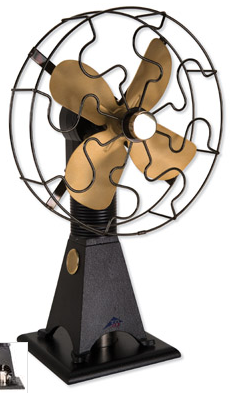 Click here to check the price of the Stirling Stove fan featured above. Anyone who has ever used a wood stove to heat a room knows they have a classic problem: the air becomes too hot close to the wood stove while the rest of the room is still too cold. Wood stove fans are a particularly good application of Stirling engine technology because the cooling air of the fan keeps the cold side of the engine cold. That’s important for getting the most power out of a Stirling engine. Stirling fans work the same way all other Stirling engines. They move the air from the hot side to the cold side and save some of the heat for the next cycle in a regenerator. They typically have an inverted gamma configuration. Imagine turning this animation upside down to get the idea. Animation of two-piston Stirling engine. Imagine the yellow disk is a fan blade and the red part is the part that is heated, either by the wood stove or by a direct flame. 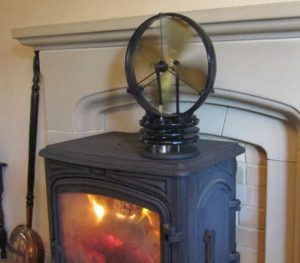 People buy modern Stirling engine wood stove fans partly because they silently move the air around the room, and also because they are beautiful artworks in motion on the top of your wood stove. Antique Stirling engine (hot air) fan. Note the heating lamp below it. At a museum in India. There is a very big reduction in temperature between the temperature of the hot fire inside the stove and the Stirling engine fan sitting on top of it. This means the Stirling engine fan can create less power and move less air than it could if the designers could move the hot side of the engine much closer to the hottest part of the flame. Stirling engines really should be integrated into wood stoves. You would simply buy the Stirling engine integrated into the stove when you purchased it. That way, the designers could make sure the Stirling engine got the optimal temperatures available from the wood fire. This would make it possible to either move a lot more air around the room, or perhaps, generate some electricity, too. One possible retrofit idea would be to sell Stirling stove fans integrated into a section of the exhaust pipe for the stove. This would make a relatively easy retrofit to existing stoves. 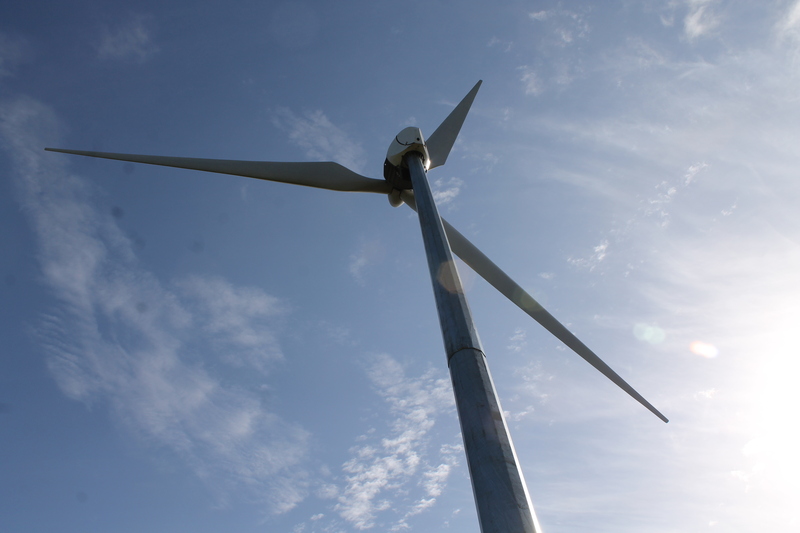 Stirling fans should be built with long slender blades like this wind turbine. When you want to make a wind turbine that makes a lot of power from a slow moving wind, you will design a turbine with long skinny blades with a large diameter. 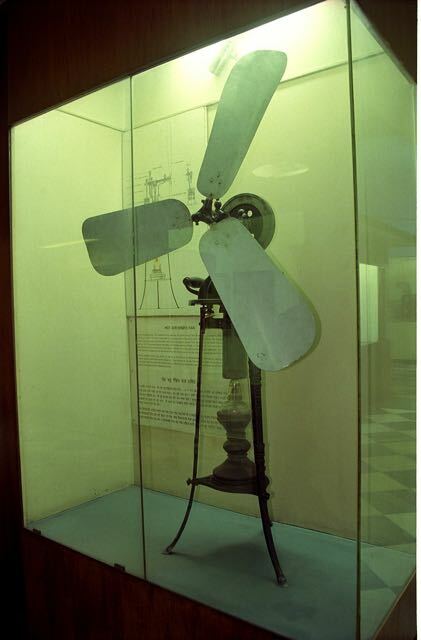 Look at the picture of the antique fan in the museum in India (above) and note that the diameter of the fan blades is quite large. The larger the fan diameter and the better the fan airfoil, the easier it is to move a lot of air with a low power engine. Stirling engine fans should not look like modern electric fans. They should be designed to make the most possible wind from a small amount of power and to do that the blades need to look like modern wind turbine blades. A good way to start with a new design or prototype fan would be to use model glider wings as fan blades. This would be much more efficient than a stamped metal or plastic blade. This would also make it much less likely to hurt somebody when they stick their fingers into the blade. If you want to make a power-producing Stirling engine at home, a fan would be an excellent first project. The problem with most new Stirling engine projects is that it’s hard to find a design that is likely to work the first time. If you are going to build a Stirling engine, your first one should definitely be a fairly close copy of a design that is known to work well. If a quick internet search doesn’t turn up the plans that you are looking for (and it might not), start by trying to meet people who collect antique engines. Look for things called hot air engines and hot air fans. Copying an antique engine that is known to work well would be an excellent first foray into making practical Stirling engines. Dr. James Senft designed a Stirling engine fan that he called the Moria, so searching on that term plus Stirling fan, may help you find plans. In his excellent book about Stirling engines called “Making Stirling Engines,” Andy Ross talks about integrating one of his Stirling engines into the exhaust stock of the wood stove. It worked well but, because Andy was not in the business of manufacturing Stirling engines or wood stoves, it didn’t go into production. The main competitor to Stirling engine wood stove fans is a solid state technology called Peltier device fans. I’ve done a complete review of a Stirling engine fan vs a Peltier device fan and that video is embedded in this page below. The technology enthusiast in me likes them both very much. Of course, I’m more of a fan of Stirling engines than I am of solid state devices, but they’re both very interesting and useful technologies. Stirling engine fans do not typically autostart as a fire is lit in the stove and it comes up to temperature. You have to gently spin the fan blade to start a Stirling fan, once it is up to temperature. But Peltier fans will auto start, which is a useful feature. The Stirling engine fans, however, usually move more air. I hope you like this video review I did of a Stirling stove fan vs. a Peltier device fan. We love to hear your thoughts about anything related to Stirling fans. Please leave your questions or comments below. Links are okay in your comments, but only to pages that feature Stirling engine fans. ¹Photo Credit: Dave at Myfordboy.